Kathmandu, October 30: End Water Poverty (EWP) Campaign, WASH Nepal and Freshwater Action Network (FAN) Nepal organized ‘Civil Society Consultation on Sanitation Status and Strategic Steps’ to review sanitation status in Nepal and the government’s policy commitments on sanitation at the national and local levels. Speaking at the programme, Umesh Pandey, National Coordinator of WASH Nepal expressed need of synergy and consolidated approach in creating larger positive impact on sanitation. Rajendra Aryal, President of Federation of Drinking Water and Sanitation Users’ Nepal informed that thousands of people are becoming victims of diarrhoea and waterborne diseases annually. “Proper sanitation and hygiene education is a must to prevent such deaths,” he added. It is estimated that 15 million people in Nepal practice open air defecation everyday. Lajana Manandhar, National Coordinator of Freshwater Action Network (FAN) Nepal opined that it would be more effective if we incorporate sanitation with tourism, agriculture and other income generating occupations. Rabin Lal Shrestha, Research and Advocacy Manager at WaterAid Nepal shared on positioning of Nepal on Sanitation Chase Matrix developed in order to analyze achievements and challenges in the sanitation sector. He told that half the population in Nepal has no access to sanitation and a quarter has no access to safe drinking water. He further said that urgent action is required to meet the government’s ambitious target of providing safe drinking water and sanitation to all by 2017 and added that Nepal needs an annual investment of Rs 7.5 billion to achieve its target. Shikha Shrestha, Coordinator, End Water Poverty Campaign Nepal, appreciated valuable strategic directions provided by the participation to enroll the path of ensuring sanitation to all. Prakash Amatya, Executive Director, NGO Forum for Urban Water & Sanitation facilitated the session on strategic steps based on four themes of ensuring constitutional right, Sanitation as national priority, One Planning One Coordination and One Monitoring System and Mainstreaming sanitation with other sectors. 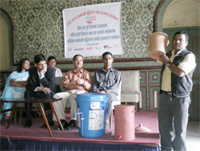 Lalitpur, October 26: UN HABITAT Water for Asian Cities Programme in association with GUTHI organized an interaction programme to discuss on HIV/AIDS and its linkage with water, sanitation and hygiene. Representatives of government agencies, national and international social organizations working in Water and Sanitation (WATSAN) sector and HIV/AIDS, and media persons discussed about the current condition of HIV/AIDS, and WATSAN in Nepal and other parts of the world. They suggested WATSAN organizations to conduct the study on the current WATSAN condition, HIV/AIDS and HIV/AIDS affected group in Nepal, and their accessibility to safe drinking water and proper sanitation facilities prior to initiating any WATSAN activities to access quality water and sanitation services. Dr. Roshan Raj Shrestha, Chief Technical Advisor of UN HABITAT South Asia Region, opined that safe drinking water, proper sanitation, personal hygiene, improved drainage and solid waste management facility helps HIV/AIDS infected people to live healthier and longer, and allow them to continue to work to sustain their families. Lynette Injette Ochola of UN HABITAT, Nairobi, while sharing her experiences in African countries, told that the People Living with HIV/AIDS (PLWHA) are more susceptible to diseases caused by unsafe drinking water and poor sanitation. She added that insecure water supply and sanitation can exacerbate the life risk to the HIV positives. She believed that life expectancy of PLWHA can be increased by accessing to safe drinking water and proper sanitation facility. She also presented some data on the condition of HIV/AIDS in Asian countries, which reveals that Asia has 5 million HIV infected people. She told that some 440,000 people were found infected with HIV and 300,000 others died of AIDS-related diseases in Asia in 2007. 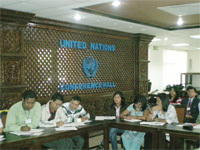 Kathmandu, October 23: A workshop on “Sustainable Sanitation in Nepal: The Way Ahead” organized by Nepal Node for Sustainable Sanitation, Environment and Public Health Organization (ENPHO) and Resource Centre Network Nepal (RCNN) stressed on the need to enhance linkages with other sectors like health, agriculture and education to effectively promote sustainable sanitation in Nepal. During the workshop, Prof. Dr. Thor Axel Stenstorm from Stockholm Environment Institute (SEI), who is also an advisor to World Health Organization (WHO) in Geneva gave a keynote presentation and appreciated the sustainable sanitation initiatives through the governmental and non-governmental sector in Nepal. Concluding his presentation, he emphasized on the need to think sanitation from public health perspective in order to establish a long-term solution to sanitation need of the people. Representatives from government, non-government, academia, UN agencies, bilateral agencies and businesses participated in the workshop. Lalitpur, October 15: Hand washing demonstration campaign was organized in two different schools—Shree Narayan Jan High School and Shree ChunDevi Primary School— of Machhegaun VDC with the joint initiation of Centre for Integrated Urban Development (CIUD) and Machhegaun Environment Improvement Committee. Female Community Health Volunteers, students and teachers supported and actively participated in the campaign. Female Community Health Volunteers demonstrated the hand washing technique such that the students get to know the exact way of washing hands using soap. Promotional materials such as soap, towel and soap case were distributed to the schools. Students found the programme exciting and educational and were happy to have such programme in their school premises. Kathmandu, October 15: Environment and Public Health Organization (ENPHO) in collaboration with various partner celebrated Global Hand Washing Day campaign at Gundu VDC, Dhulikhel Municipality, Lalitpur Sub-Metropolitan City and Ratna Park area of Kathmandu for a week. It mobilized 85 Paschim Paila Youth volunteers, most of whom were public health students, for the campaign. A one-day interaction program on Global Hand Washing Day was held with 36 schools’ teachers in different locations. Orientation program of Health and Hygiene focusing on hand washing with soap was carried out to about 6,000 students of 36 schools. Hand washing demonstration programme was done in 37 schools and by guest celebrities, CA Member Hon. Nabindra Raj Joshi and senior journalist Bhirab Risal at Shanti Batika (Ratna Park) at the same time on October 15. Lalitpur, October 13: To mark the World Hand Washing Day 2009, Lalitpur Sub-Metropolitan City (LSMC), Environment and Public Health Organization (ENPHO), and Urban Environment Management Society (UEMS) distributed household water treatment kits to 11 schools and 20 health clinics in Lalitpur. The household drinking water treatment kits include bio-sand filters with 50 litre capacity, 61 colloidal silver filters, 1200 SODIS bottles and chlorine solution. The distribution of household drinking water treatment kits was a part of Partnership for Safe Water Campaign supported by the UN HABITAT and Bottlers Nepal to raise public awareness on safe drinking water, health and hygiene at school and community level. Speaking at the kits distribution programme, Chief Executive Officer of LSMC Binod Prakash Singh told that people were still ignorant about the sanitation measures undertaken. He opined that simple household water treatment options should be promoted widely to access safe drinking water for all. He also requested all the stakeholders to work hard for increasing accessibility of poor communities to safe drinking water service. Padmaja Shrestha, programme manager of ENPHO and Dal Bahadur Singtan, Executive Director of UEMS explained about various WATSAN activities implemented in Lalitpur to extend safe drinking water service in the area. 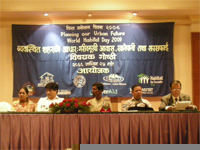 Kathmandu, October 13: A seminar on pro poor housing, water and sanitation services was organized in the Kathmandu on the occasion of World Habitat Day 2009 with a common theme “Planning for a better urban future”. The local government, civil society organizations and local community in six cities including Biratnagar, Bharatpur, Birgunj, Hetauda, Itahari and Kalaiya are working together to make these cities a better place to live for all and particularly the poor. The seminar intended to share successful experiences of these cities in housing the poor and improving access to basic facilities such as water and sanitation, with policy makers and other stakeholders so that lessons learnt would pave the path towards planning for a better urban future. Addressing the inauguration programme, Assistant Minister at the Ministry of Physical Planning and Works Kalawati Devi Pasawan requested all the stakeholders to keep poor and backward groups in prime consideration while implementing their shelter programme activities. She assured that the government of Nepal and political parties will provide support to the activities initiated to provide shelter to target groups. Director General of Department of Urban Development and Building Construction Indra Bahadur Shrestha informed that the government will re-establish the squatters by providing them an alternative shelters. He added that the process has already been initiated in Siraha, Saptari and Kapilvastu districts. He further added that the government has allocated a separate budget for this purpose. Prafulla Man Pradhan, Programme Manager of UN HABITAT, believed that poor management of water and sanitation, and increasing environmental pollution is the drawback of unmanaged urban growth in Nepal. In his opinion, unplanned urbanization is the root cause of increasing crime and corruption in these cities. Rabin Lal Shrestha, Research and Advocacy Manager of WaterAid Nepal, told that the lessons learnt from experiences and challenges in big cities should be taken into consideration while planning for further urban development. “We formulated policies but failed to put them into practice, supported with a proper monitoring mechanism,” Shrestha added. Karuna Paul, Country Director of Habitat for Humanity requested all stakeholders to implement shelter development activities in squatter and slum communities. Kathmandu, October 9: Constituent Assembly members, journalists and representatives of different organizations working in water and sanitation sector have stressed to establish safe drinking water and improved sanitation as a fundamental right in the new constitution of Nepal. 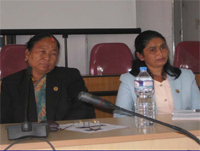 The views were expressed in an interaction programme organized by Federation of Nepalese Journalists and WASH stakeholder in the meeting hall of constitution committee within parliament house at Singha Durbar. Addressing the interaction, Binda Pandey, chairperson of the Committee on Fundamental Rights and Directive Principles (a committee under the constituent assembly committees) expressed that media should play a pivotal role to raise awareness on safe water and sanitation. She informed that the committee is presenting a proposal with special provision for the implementation of directive principles in the new constitution. She requested the civil societies to provide more concrete suggestions that could be included in the new constitution from sanitation and water perspective. 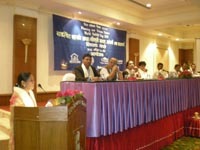 Stating that condition of sanitation is very critical in Nepal, Umesh Pandey, National Coordinator of WASH Nepal emphasized that sanitation and water should be established as a constitutional right all the more reason because these services has a direct impact on sectors like health, education and poverty reduction which hold great national priority. He further expressed that the political parties should establish sanitation and water as a fundamental right in the new constitution as mentioned in their manifesto. Rajendra Aryal, president of Federation of Drinking Water and Sanitation Users’ Nepal focused on need for separate section of water and sanitation sector in the new constitution. Lajana Manandhar, Director of Lumanti Support Group for Shelter, emphasized that there should be accountable state to ensure sanitation access to marginalized people. Bhushan Tuladhar, executive director of Environment and Public Health Organization opined that constitution should be made specific that would be easier for government to track progress and added that global movement should also be considered while drafting the constitution. Gagan Thapa, CA member expressed that it is the responsibility of the state to provide safe water and sanitation facility to its people, hence as far as possible, priority will be given to include these provisions in the new constitution. He pointed out relevance of CSO reminders for materializing regional and global commitments of the government. 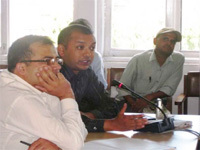 Dharmendra Jha, president of Federation of Nepali Journalists, told that it is the responsibility of the government to arrange basic necessities of life and the government should consider it while making the new constitution. 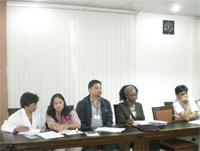 He expressed that media should support the initiatives to ensure right to dignified lives. Dal Kumari Sunuwar and Arvind Saha, CA members expressed their commitment towards combating the concerns of sanitation and water including their support in recognizing sanitation and water as constitutional right.